When we travel, I like to crochet. It is such an easy take along craft. This summer, I am crocheting with t-shirt yarn. 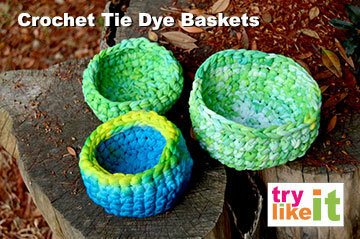 I’ll show you how to make the yarn from a t-shirt, how to dye it, and how to crochet a small catch all basket. The basket is made from one large t-shirt and takes about an hour to crochet. This fun tutorial link got submitted by Try It Like It. Crochet your own t-shirt yarn baskets and read the full tutorial through the link below!